For the recording Arthur Weisberg led the Contemporary Chamber Ensemble, a group of New York free-lancers, who started working together in the '60s when such groups devoted to new music were exceedingly rare. (I believe they may have been the first such ensemble in the United States.) The very high level at which they performed is attested by their numerous recordings on Nonesuch, including works by Geoerge Rochberg, Richard Wernick, Lalo Shifrin, and Stefan Wolpe, as well as many others. The personnel included pianist Gil Kalish, a superb collaborative pianist (Jan De Gaetani's longtime accompanist - their Ives recordings have never been bettered) as well as an underrated solo artist, with wonderful Ives and Haydn recordings on Nonesuch. I remember Weisberg giving brilliant performances of works by Elliott Carter, Donald Martino and Earle Browne with a student ensemble when I attended Yale's summer program at Norfolk, Conn. in the early 80s. The story of Nonesuch is incomplete without the name Teresa Sterne. It was her vision that made Nonesuch such a remarkable label during the 1960s and '70s. Nonesuch remains a valuable enterprise, but it seems a shame that the current management's taste does not encompass more of the kind of composers that were represented on the label during Ms. Sterne's tenure. On a personal note: I once experienced a memorable elevator ride at Carnegie Hall, riding in the same car with Tracy Sterne and Issac Stern. (no relation.) Ms. Sterne took the opportunity to bring up the apocryphal review of Mr. Stern's violin playing, headlined "No tone left un-Sterned." There is a wonderful reminiscence by Ms. Sterne of the recording sessions for Ancient Voices, found in the C. F. Peters volume about Crumb, issued in 1986. The all-night session for Ancient Voices took place not in a studio, but in the unheated, freezing cold ballroom of a New York hotel. Incredible that one of the greatest recordings I know was made under such circumstances. Thanks again for your stimulating writing. Trivia, did you know the potato chip was invented by a different George Crum, who was an African/Native American? But back to the music, another classic Nonesuch recording here. Email received:Thank you so much for using my notes about George and Ancient Voices. Always happy to see George and his music brought to people's attention. Besides the Nonesuch recording of Ancient Voices, I think your readers would be interested in exploring the remarkable "complete George Crumb edition" - a series of recordings of George's music released by Bridge Records. George continues to write, so in that sense the edition is not yet complete! But these fine recordings are a highlight in Bridge's wide-ranging catalog. With your interest in imaginative programming, you would have enjoyed a performance of George's Black Angels I witnessed at the Trondheim (Norway) Chamber Music Festival a couple of years ago. The piece was performed at midnight in the Trondheim cathedral - juxtaposed with a performance of the plainchant Requiem Mass - the chant Dies Irae being quoted in George's piece. The venue - the hour of the day - the carefully planned lighting - and the excellent performances - all made for a most memorable experience. Thanks for this. I just returned from the basement, where I got my Nonesuch LP out. Haven't listened to it for a while. I recall that it was one of 2 Crumb LP's which I bought after hearing a Crumb evening put on by Robert Aitken's New Music Concerts in Toronto in the early/mid-70's. The program also included Black Angels (masks and all). Remarkably, the organization is still active, including some recent CD's - www.newmusicconcerts.com . 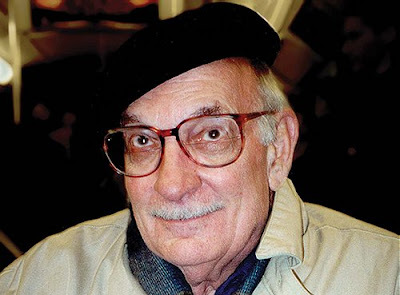 Pliable, thank you very much for reminding us of George Crumb’s upcoming 80th anniversary. While I just missed the world premiere of “Ancient Voices of Children” at the Library of Congress, Washington, in October 1970, with the Contemporary Chamber Ensemble, Arthur Weisberg, Jan DeGaetani, and Michael Dash; I found -- a few months ago -- my program for a performance of the work in January 1974 in Berkeley, California, with the same ensemble, director, and soprano (I think that there was a different boy soprano). 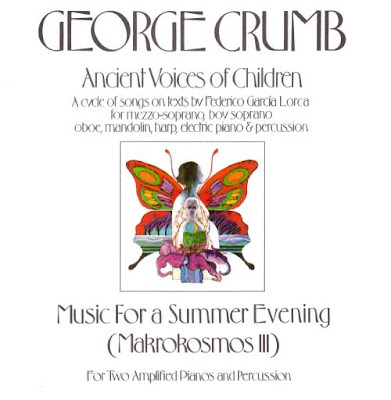 I was also fortunate, about three months later, to have attended the world premiere of the other work on the “Ancient Voices of Children” album – “Music for a Summer Evening (Makrokosmos III)” –on a spring evening which also included – unsurprisingly – Bartok’s great "Sonata for Two Pianos and Percussion." I envy you your Crumby experiences. And I’ll admit that I missed the New York Phil premiering Crumb’s Star-Child in about 1977, and am still waiting for a lower-priced copy of the Bridge 2005 recording under Thomas Conlin and the Warsaw Philharmonic.